Product prices and availability are accurate as of 2019-04-19 16:31:35 UTC and are subject to change. Any price and availability information displayed on http://www.amazon.com/ at the time of purchase will apply to the purchase of this product. 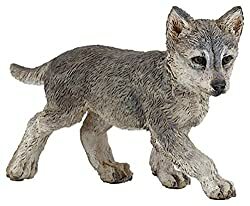 The wolf cub from the "canis lupus" species is born after a gestation period of between 61 and 63 days (approximately 2 months). It is born as part of a litter of 1 to 3 cubs if the mother is very young although this may rise to 7 if the mother is older, as the she-wolf's fertility increases with age.